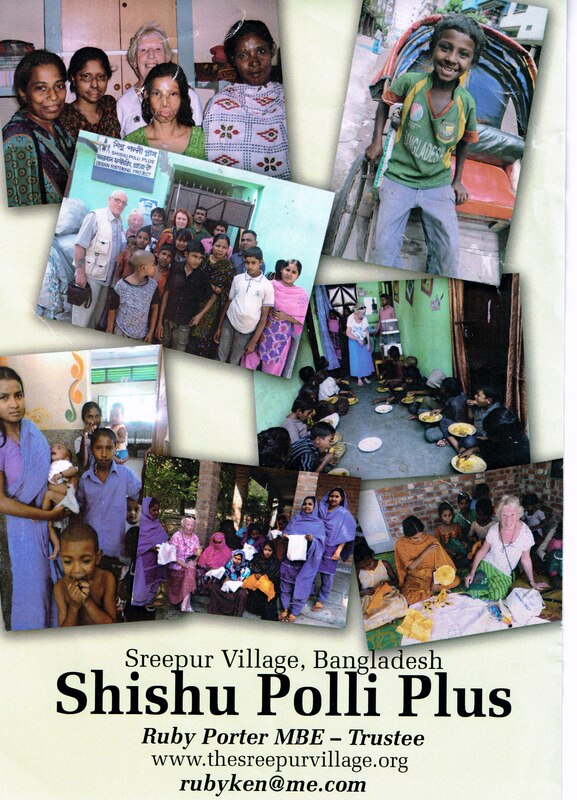 Rubina Porter has worked with the Orphanage in Sreepur, Bangladesh since 1990. During this time she has visited 29 times and is in the process of organising her 30th trip. During her time with the Orphanage she has constantly worked at raising funds to improve the lives of the orphans and frequently visits the Orphanage to teach embroidery. 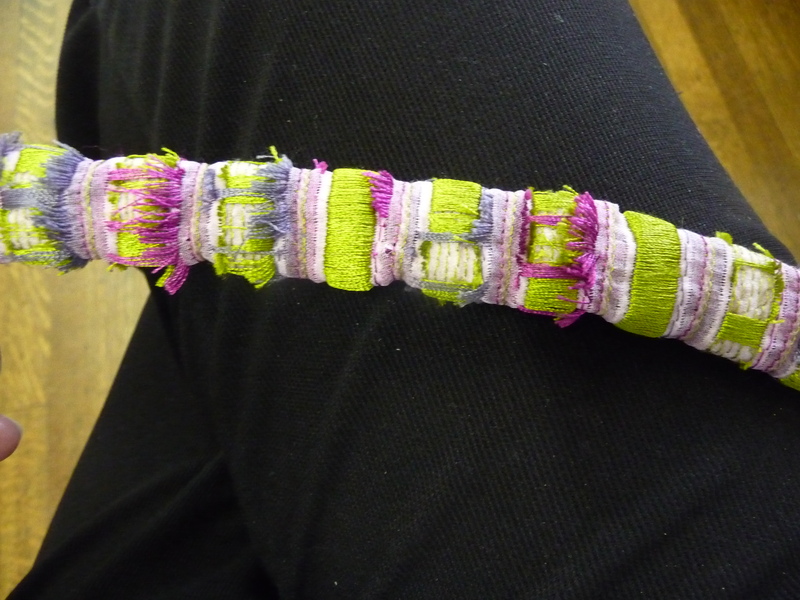 She was recently approached by The Craft Museum of Finland to produce an item for exhibition. She produced a box made of Sreepur woven silk, dyed with tea and embellished with dyed threads. 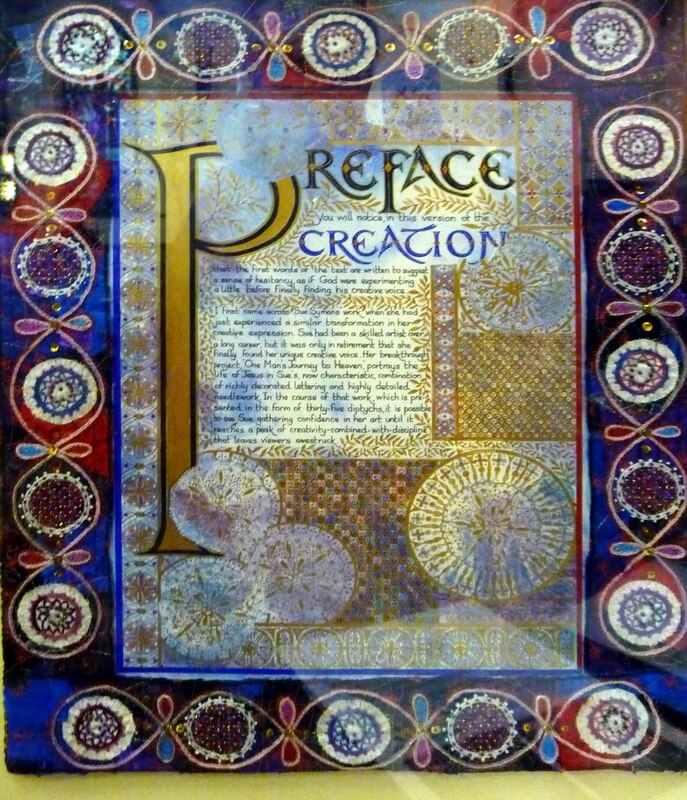 It was accepted and was on display at The Craft Museum in Jyvaskyla. Recently Ruby Porter and friends have raised an amazing £4,000 for the Sreepur Orphans’ Village and Womens’ Refuge in Bangladesh. The money came from the proceeds of an exhibition of the Sreepur women and children’s needlework at the Town Hall in August, and at other venues, including Calderstones Park. The exhibitions are staffed by Ruby, a member and former Chair of this Branch, and her friends, also members of our Branch. The sum raised is a fantastic achievement and is going to a very worthy cause. We congratulate everyone involved and all those members who helped or visited the exhibition. Here are some of the young children and women from the Sreepur Refuge with their embroideries, which are used as therapy to help them after terrible abuse. 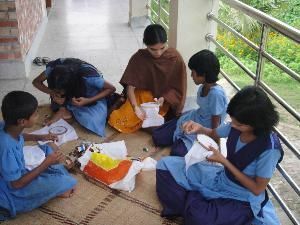 The photograph shows Sabita teaching embroidery at Sreepur. She was abandoned at the Orphanage as a baby. At 16 she left, but found it difficult to find work due to her walking disability caused by Polio. 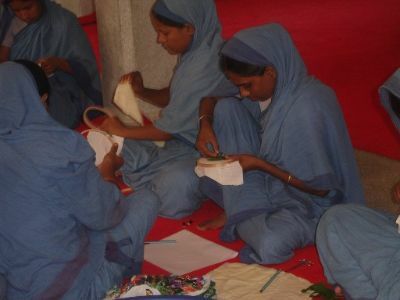 As her embroidery skills were excellent the Orphanage has recently employed her to teach the children embroidery. Meeting my sisters and understanding my mother………..
A reflection by Janette Porter ( daughter of Ruby Porter, a Shishu Polli Plus trustee) after her first visit to Bangladesh in October 2011. Now bearing witness to my mother’s self-confessed addiction, recovery not an option, to Bangladesh and in particular Shishu Polli Plus, I have gained a deeper insight into my mother’s unreserved compulsion to work towards the development of this incredible charity. I now also understand her dedication to the care of the people there and why this permeates through our extended family and community networks. I had only scratched around on the surface of what SPP was really about, regurgitating stories our mother tells us and has continued to do so from her 31st visit over a twenty year period. The stories of people I feel I know, places seen in photographs are all real to me now, a taste of SPP, the humidity of Bangladesh, the dull drowning sounds of horns beeping are now a memory for me to share. Once at Sreepur Village my sisters, brothers and aunties welcomed me into their lives with open arms and as they did my heart filled with gratitude for their kindness. I now know the sisters my mother talks about and I have heard their inspirational stories. the generosity of self and shared happiness is one to witness, as a relayed story never touches the heart as a smile and kindness does of a person standing beside you. The work of Sreepur Village is overwhelming; all the very lucky people who are cared for by the charity are offered a life changing opportunity through education. I was humbled by the young people who, like sponges, soak up all the knowledge that is being shared, a sad reflection on our UK school children of whom I have five. School is compulsory. Morning, afternoon and evening classes are taught to a very good standard for all children of school age. In addition all mothers are offered classes on a rota system, whereby mothers share responsibility to care for each others babies and pre-school children, whilst other mothers attend evening school. I sat in on both mothers’ and chilrdren’s classes in Mathematics and English. I saw the eagerness to learn and they shared with me their knowledge. I was invited to speak a little Bangla (there is clearly a need for more Bangla classes for me !) I have found a Bangla community school in Liverpool UK where I live, but I have not been brave enough to attend yet, I think the learning of Bangla language is possibly something for my mum and me to share. The teachers who work at Sreepur have high standards, much care is taken to employ quality graduates to cater for all the needs of those who live at Sreepur Village. I was grateful to have a conversation with Mr Salam the art teacher. Being a practicing artist myself I was keen to see how the art curriculum was being delivered. I was impressed by the space Mr Salam taught art in – it reminded me of art school in the UK. He worked very well to use his resources to the best of his and his students’ ability, and proudly showed student work to me. The work was also on display around Sreepur as well as in the Dhaka office. 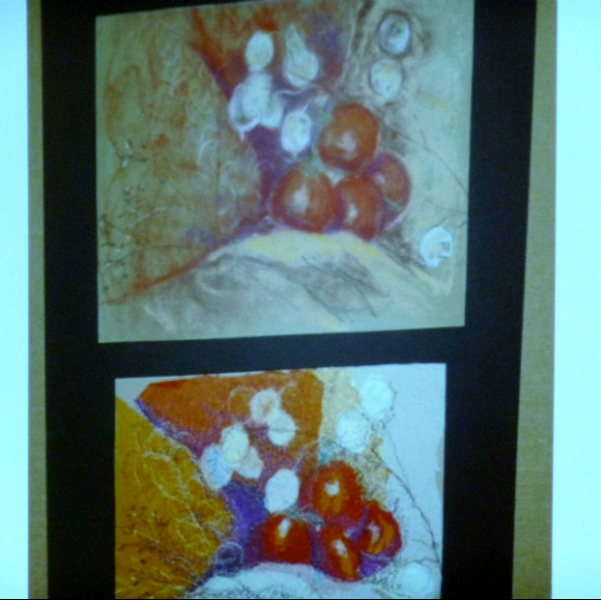 What struck me most, though, was that Mr Salam has his own art work on display in his classroom and in his journals. Mr Salam has a Masters in Fine Art and is a graphic designer. His finely drawn sketches were outstanding, clearly his practice as an artist is as important as his teaching. Sreepur village students should be proud to have such a talented artist and teacher teaching them the skills of fine art. He, like the other teachers I met at Sreepur village are an asset to the work of the charity – they offer all the people they teach not only quality education but a humanitarian life opportunity. I was inspired by the work of the school and of SSP’s work throughout Dhaka and the Gazipor region. There is a continuing education outlook, a privilege to those who are very fortunate to recieve it. the preciousness of education is not taken for granted, it is valued and respected. My visit to Bangladesh was a journey shared with my mother Ruby. I was astounded by her energy and life in Bangladesh. Our visit was a bonding journey for me. I feel that I now know what drives her to constantly work towards what is best for people who are in the care of SSP. I saw a side of my Mum that makes me respect her more, her dedication to Bangladesh and to SSP is incredible. I am honored to be her daughter as I know all my Bangladeshi sisters are too.